It's Kingbird peninsula again, with miles of open water in every direction and the driveway just barely above water. 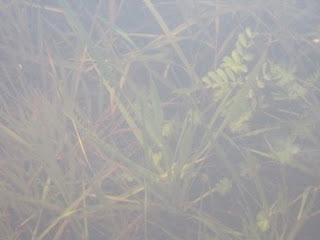 On a long canoe outing on Thursday I snapped this photo of submerged vegetation on a whim. More photos at this link. Stay warm and dry! Jonas and Anna, two delightful visitors from Copenhagen, have graced Kingbird with their presence for the past 10 days. They got up-close-and-personal with yards of horse manure, mixed potting soil, made soil blocks, planted seeds, and seemed to have a good time. And they blogged about their experience here. My Danish (sorry Grandpa Frederik!) is not what it should be, but Ms Kingbird assures me that they allude to my rugged handsomeness, her grace and beauty, and the sublime pleasures of life at Kingbird. Happy travels, Jonas and Anna!